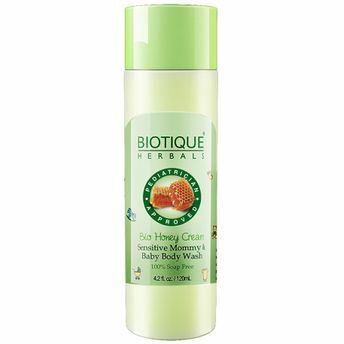 Biotique Honey Cream Sensitive Mommy & Baby Body Wash in India. Give yourself and baby a luxurious, soothing shower experience with Biotique Honey Cream Sensitive Mommy & Baby Body Wash. This gentle, 100% soap free gel is a natural blend of pure honey, aloe vera, manjishtha, nutgalls carrot and sandalwood. It gently cleanse and nourish baby's and mommy's sensitive skin. Infused with honey cream this body wash pampers the skin.